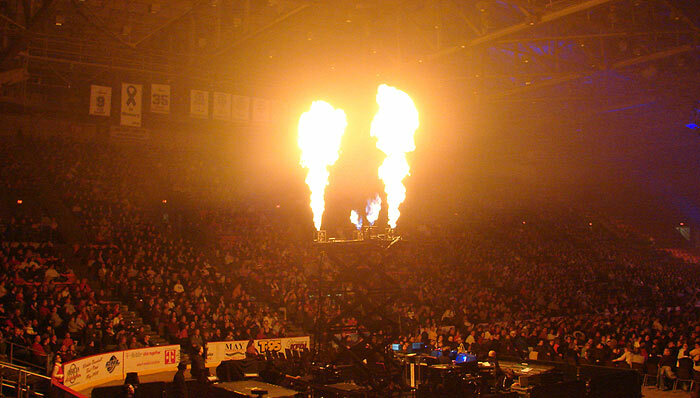 A week ago Friday, Ace took a date to see the Trans-Siberian Orchestra at the Kansas Coliseum, near Wichita. As chauffeur, I was allowed to tag along. Those are green lasers emitting from the stage. 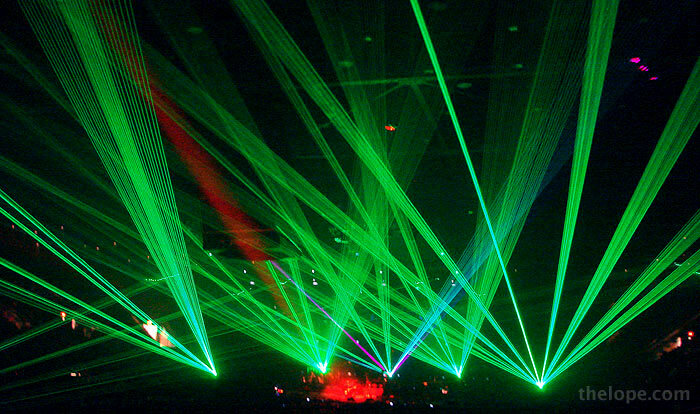 Call me shallow but I'm always impressed by a good laser show. The show is best described as hard rock Christmas songs with a bit of narration, opera and classical thrown in. 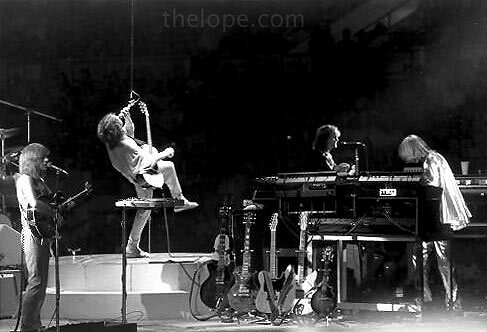 A friend of mine, who also went, described it as "a jazzed-up ELO (Electric Light Orchestra)." 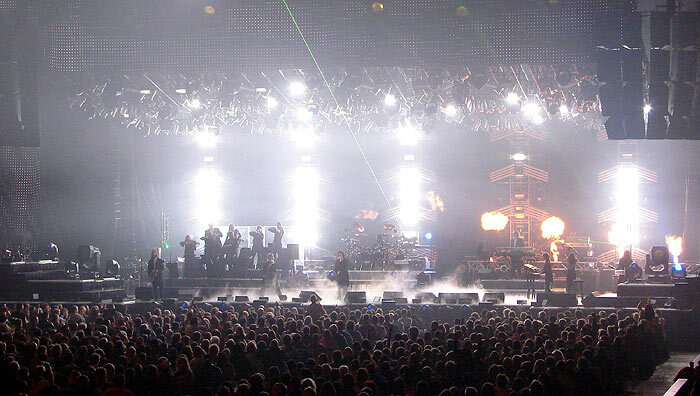 Note the balls of fire on the right side of the stage. The light show was fantastic, but then, that's no surprise since its one of the group's selling points. The lighting rigs often moved, which was quite an engineering feat, especially as they had to do so without excessive noise or danger to musicians below. 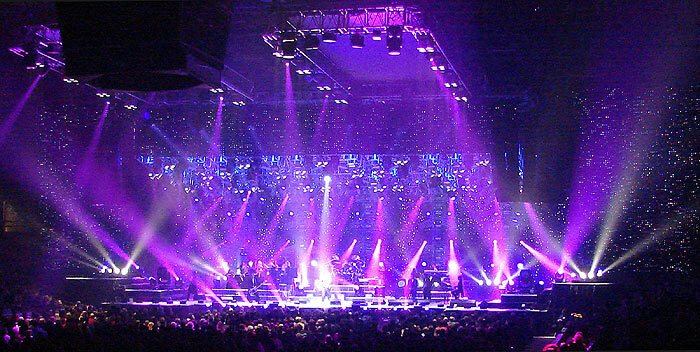 Several large electronic backdrop curtains varied their appearance considerably, as shown in the starry background above. I did think the first half of the show contained a bit too much forced sentimentality in the narration between Christmas songs, but judging from those around me, my feeling was not shared. I also thought the head-banging, hair tossing behavior of some of the performers, particularly the guitarists, was a bit overdone; but then, I'm used to geezer rock, as my significant other calls it, and 60 year-old prog-rock musicians don't do a lot of head-banging at those reunions. And I should clarify, the musicianship was really good. I particularly enjoyed the second half of the show with its hard rock and classical emphasis (Carl Orff's Carmina Burana is just made for bombastic presentation). 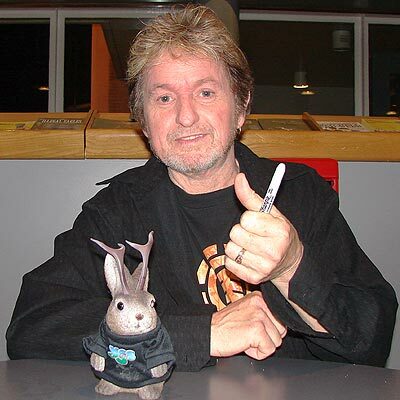 I know this band has hosted special guests, like Greg Lake of Emerson Lake and Palmer (ELP) and Jon Anderson from Yes on previous occasions; I'd sure like to see TSO, as its fans call it, do more progressive rock from the likes of Yes, Genesis and ELP. Speaking of ELP - with all those lasers, explosions, histrionics and running musicians on lifts, the show reminded me of a high-tech musical circus. I could easily imagine the Master of Ceremonies shouting "Welcome back my friends to the show that never ends" ala ELP's Karn Evil 9. This very talented operatic singer (with "legs all the way up", said a friend) was on a stage opposite the main stage on the floor. This was one of two times performers ran back to this rear stage and gave those with the more distant seats a thrill - and this chick actually sang as she ran. The rear stage was a very nice touch, and really lessens any dissatisfaction of having far-back seats. Of course, with the huge light show on stage, there was plenty of detail to see on any scale. Like I said, all those special effects are great selling point. It's no coincidence that TSO was used in a much net-forwarded video featuring a house with synchronized Christmas lights. woman: "Lets go to the (man isn't paying attention to name) orchestra." man: "I want to stay home and watch football." woman: "There'll be women, fire and lasers." man: "I'll get my coat." I was rather confused as to whether photography was allowed. I called the Kansas Coliseum on the day of the show and was told is was allowed, as long as the camera was not professional with "real lenses" (plural). This was in line with what their website states. My camera, a half-dead Sony DSC-H2, is pretty much an expensive point-and-shoot with a non-interchangeable lens. 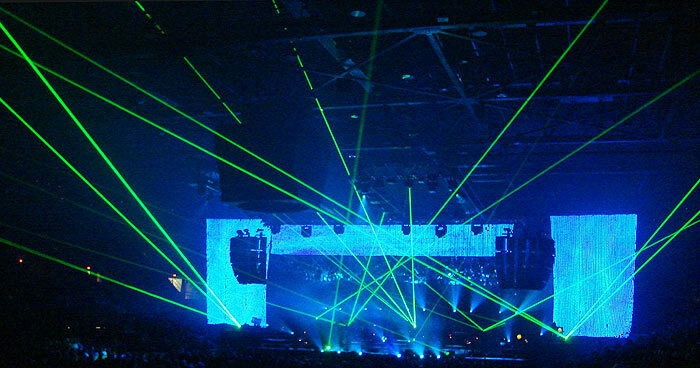 Early in the show, but after fog machines had been used to accentuate the lasers, a woman beside me used a small point-and-shoot camera and her flash, doubtlessly set to the default setting, went off. Flashes, you know, are more than useless at such a distance in a fogged room - they actually sabotage your chances of getting a good shot because they light up the smoke between you and the stage, resulting in an underexposed, whitish mass. Immediately after this, a security person descended on her and said that no photography was allowed. I was relatively sure I should go with what I was told by the office and not what one security person had said, but I was cautious in my use of the camera. Upon leaving the arena, I spotted this sign. Whew! I hadn't seen it coming in, probably because we were in such a crush of people trying to get in the doors and out of the cold. 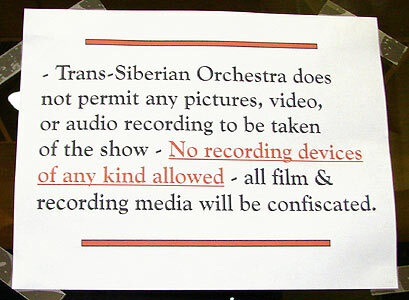 Would I see TSO again? It's never to early to plan one's wardrobe for the next big trip. Ace will be going out west again in the Spring, so in his pursuit of a good bola tie, he sought the expertise of jackalope chauffeur and jewelry designer Mia Denman, who made the pieces below. This one reads "wisdom" on the necklace clasp and "luck" on the bracelet clasp. I've never worn jewelry, although I once wanted a Green Lantern power ring. However, I do like to look at Mia's works, particularly those which use stones. On the way back to Hutchinson Saturday morning, I was becoming concerned about an ice storm that was forecast for the weekend and I wanted to buy some ice melting granules for my sidewalk. 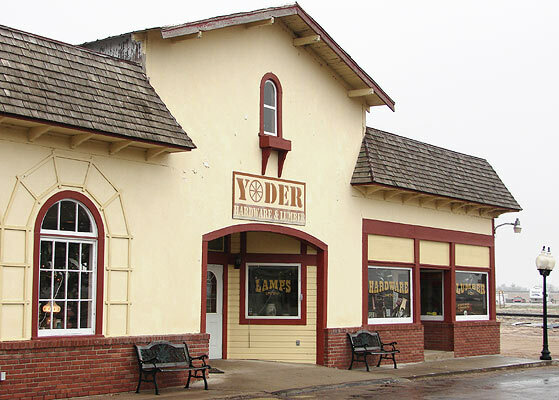 I tried to add some charm to my afternoon and avoid the crowds at Wal-Mart by stopping at Yoder Hardware, a few miles from Hutchinson in the largely Amish town of Yoder. I don't often photograph the Amish - they're not crazy about that - but I did show their preferred method of transit in a previous post on the MCC Sale. 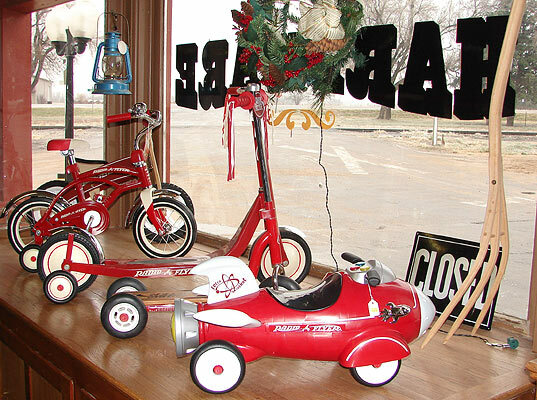 I was immediately struck by the contrast of a retro pedal rocket in an all-wood hardware store. I don't expect such a place to evoke the future that wasn't. 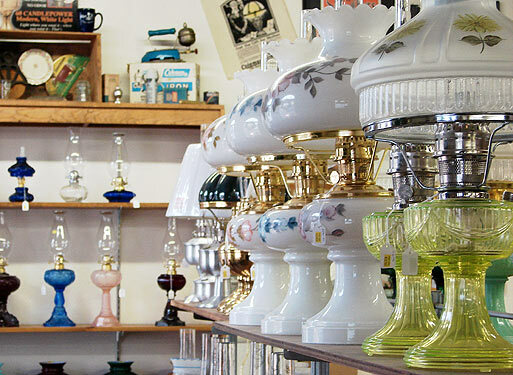 Because this store caters to the Amish, they carry an extensive supply of oil lamps and accessories. Just a few days later, as I sat in the dark, I really wished I'd have bought one of those. We used to have these match holders at our cabin when I was a kid. I had no idea they were available new. I asked the proprietor if these basic wooden toys (Lincoln Logs, Tinkertoys, etc.) were sold primarily to the Amish or to tourists. He said they were "for all kinds." I rather suspect they are usually bought by tourists. "Sleigh bells ring; are you listening?" These are real sleigh bells, made by a local harness maker. 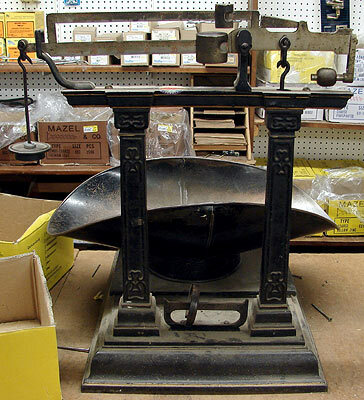 This antique scale is still used for weighing nails. 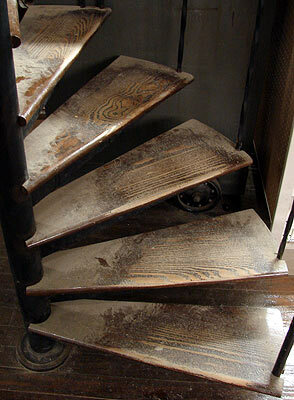 I loved the wooden spiral stairs. 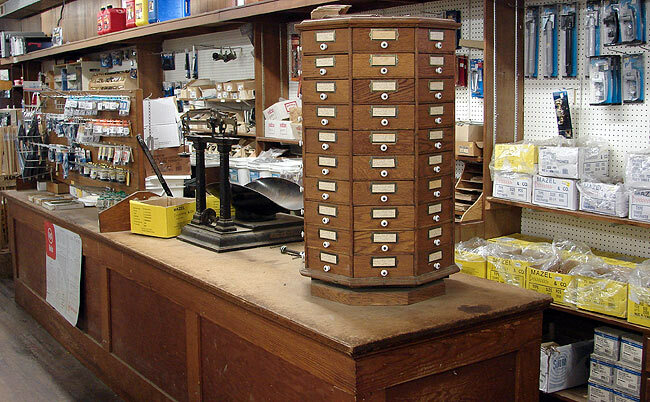 I asked the age of the store and was told it dated to 1926, with a few additions since then. This rotating octagonal cabinet holds screws of various sizes. Foreseeing a winter like the last one - full of ice, snow and (what I hate to walk in the most) slush, I bought a set of these no-frills rubber boots. I am told farmers use them for mucking through mud and all sorts of livestock by-products. As I trounced around in a blanket of snow the following week, I was sure glad I had them. 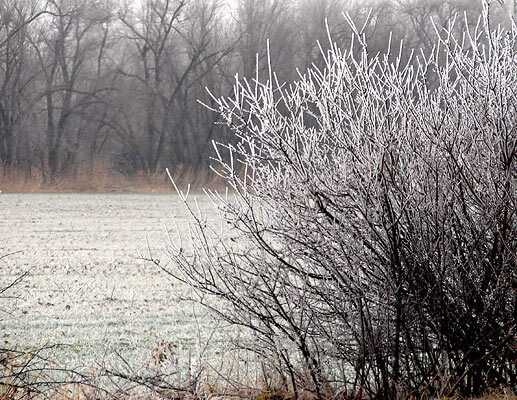 On the way down Yoder Road to Hutchinson, I saw a preview of what the next few days would bring. I remember thinking "cool; I have an ice photo." If I only had known this wave of ice was only a precursor to a more devastating ice storm that would come two days later. 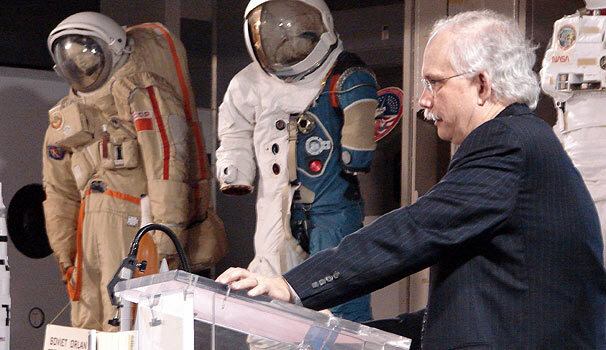 Saturday afternoon, I attended a lecture at the Kansas Cosmosphere and Space center. 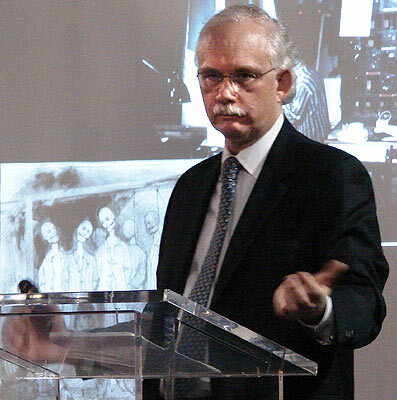 The speaker was Dr. Michael J Neufeld, Chairman of the Space History Division of the National Air and Space Museum. I've enjoyed the Smithsonian a few times, and used a few of my pictures from the Air and Space Museum for a story on the anniversary of the moon landing. He spoke mostly about the topic of his book, Von Braun: Dreamer of Space, Engineer of War . Von Braun is one of history's morally ambiguous characters - a prime mover in both the Nazi rocket program and the subsequent U.S./Soviet space race. There is a really good, concise interview with Neufeld about Von Braun at the Smithsonian's Air and Space magazine online. In it, Neufeld says Von Braun had "sleep-walked into a Faustian bargain" with the Third Reich, as far as the use of concentration camp labor in the production of the rockets which impassioned him. Now that's a good quote. Speaking of good quotes, I was able to question him about Sputnik and Vanguard imagery in order to update my story about Sputnik's effect on Mid-20th Century signage. From moral ambiguity to party gaiety. 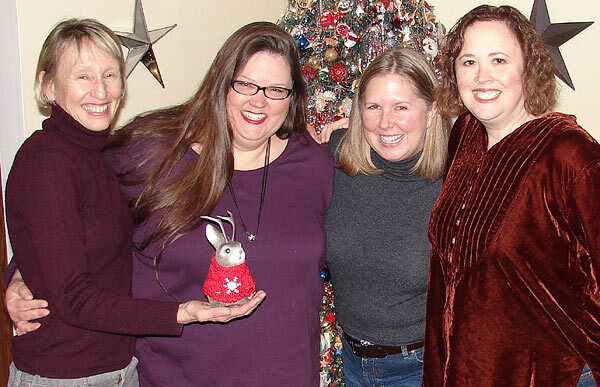 Ace attended Patsy Terrell's Christmas party that night. Here he is with Hutchinson's Vice Mayor Trish Rose, Patsy, Kris Schindler, and Andrea Springer. I asked Trish why vice needed a mayor. I knew it was a bad joke, but I couldn't stop myself. She said she hadn't heard that one. I fondly remember getting to know Andrea when she hosted the local public radio station's new age music program, Nightcrossings, back when new age was new. 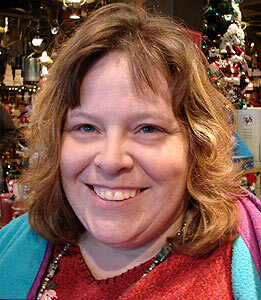 Since then she's had a knack for interesting work, having been involved with the beautiful Fox Theatre, for example. He always wishes to dress nicely for such a special occasion, so Ace wore a sweater he obtained at Harrods last year. 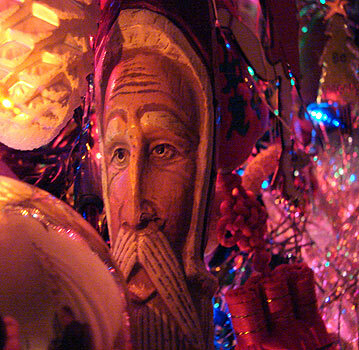 I had to delve more into the ornaments on Patsy's Christmas tree. 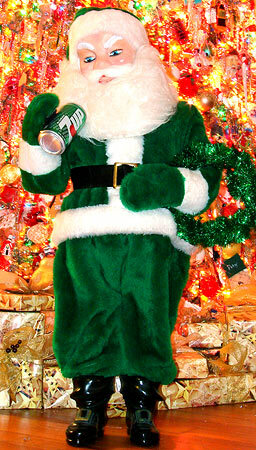 This green Santa also made an appearance. 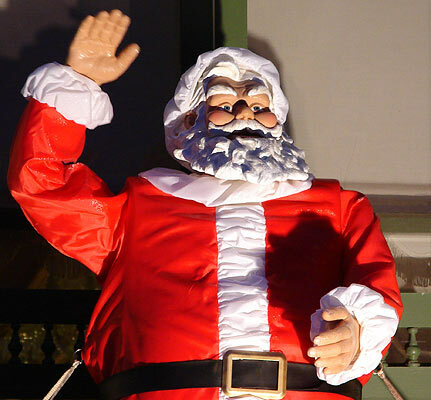 He's a 38-inch 7-Up point-of-purchase display made by the defunct Superior Display Company of Kansas City. 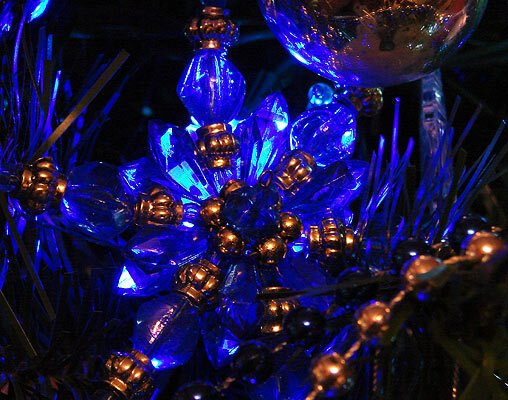 I'd love to know more about the history of commercial Christmas display manufacturers. I invite anyone with similar interests to contact me via the email address listed on my blogger profile. I found this really impressive display of home-made Christmas automations in Hutchinson last Sunday, but that will have to wait for better weather and restored power to fully document them. I'm afraid that many a light display is now damaged. However, I was able to get out tonight (Dec 16) and shoot a few that were powered. Until I an shoot more of this man's work, here's a teaser. I've yet to find an automated Christmas display anywhere that matches the sheer cacophonous mass of Mike Babick's house in Prairie Village, Kansas. 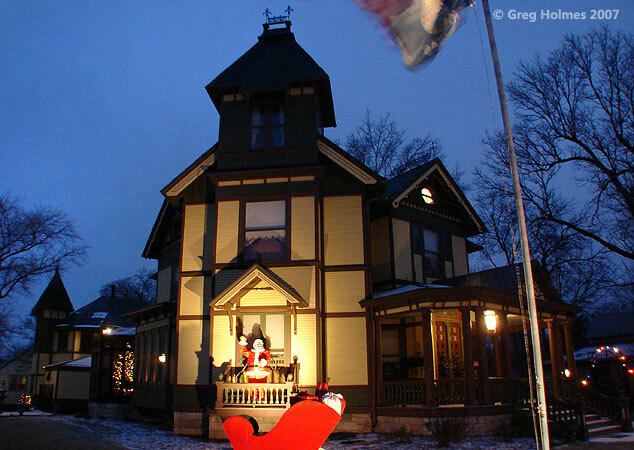 But in the meantime, I can show you a quite respectable automated Santa Claus who holds court from a stately Victorian home at First and Plum streets in Hutchinson. I don't know who manufactured him, but I'd lay odds on Gemmy Industries of Texas, though he doesn't seem to be in their catalog now. 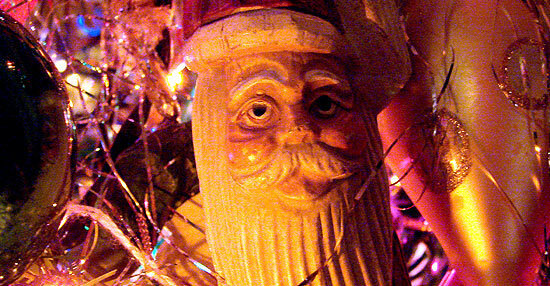 This Santa talks and sings, so of course I shot a video clip. Play me out, Santa! 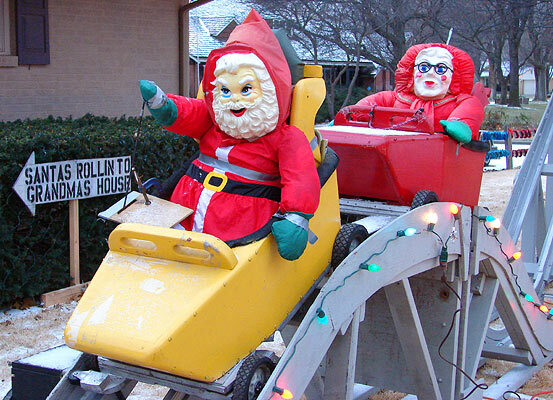 The best animated Christmas display in the old Burns display now shown every Christmas in Wichita Falls Texas on the campus of Midwestern State University. I grew up with the display. It is awesome. You should check it out. Ace with *four* chicks? Is this a personal record?